Although we were conflicted about leaving for a travel assignment by AAA in the Bahamas (hard decision), we asked our youth minister Brandon to housesit while we were gone. 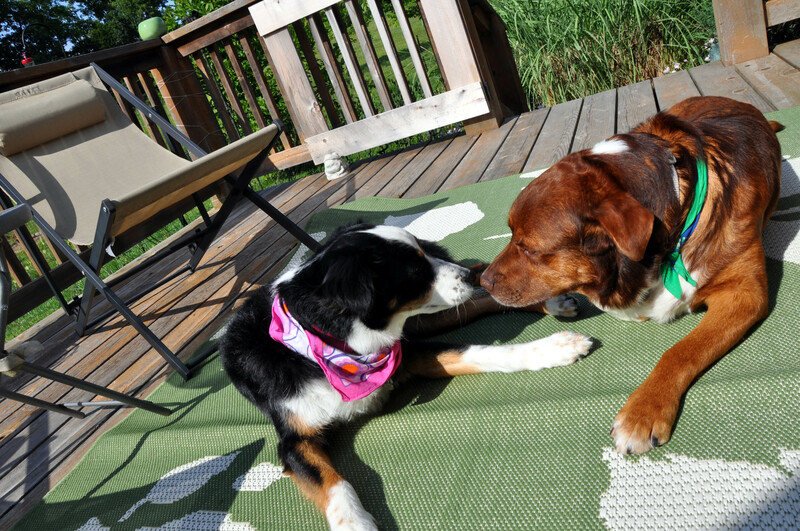 Since the arrival of the new dog, our other dog, a mini Aussie has been quite happy and content. She was quite a gatherer. We were used to seeing shoes, cat toys, pillows, underwear, among other household items waiting for us after we arrived home from errands. Three days into our vacation, we Skyped with our house sitter and he alerted us to the fact one of the dogs must have been frustrated while we were gone. 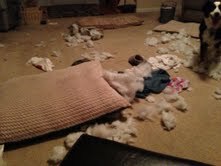 So much so, they destroyed a bed pillow, and a ‘cuddling’ pillow the three-legged cat likes. And the TV remote. I have to admit I laughed so hard, tears flowed freely when he showed us the photos. 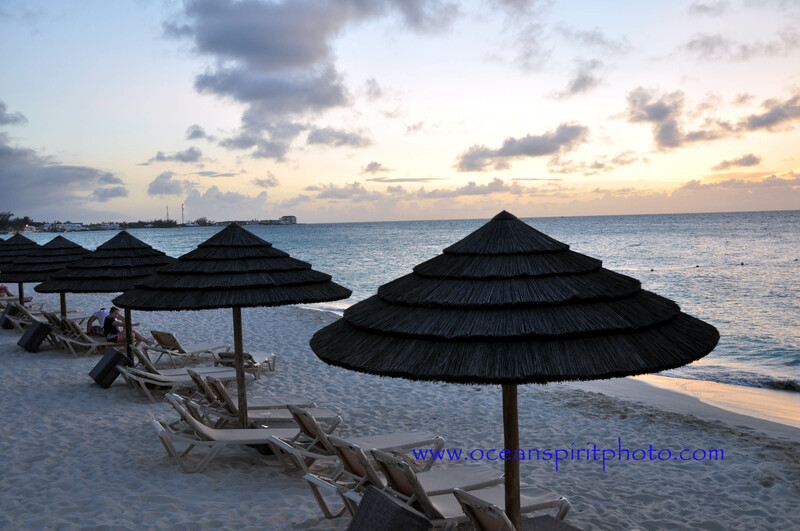 I imagine my carefree attitude had something to do with the lovely Caribbean atmosphere of Sandals Resorts. 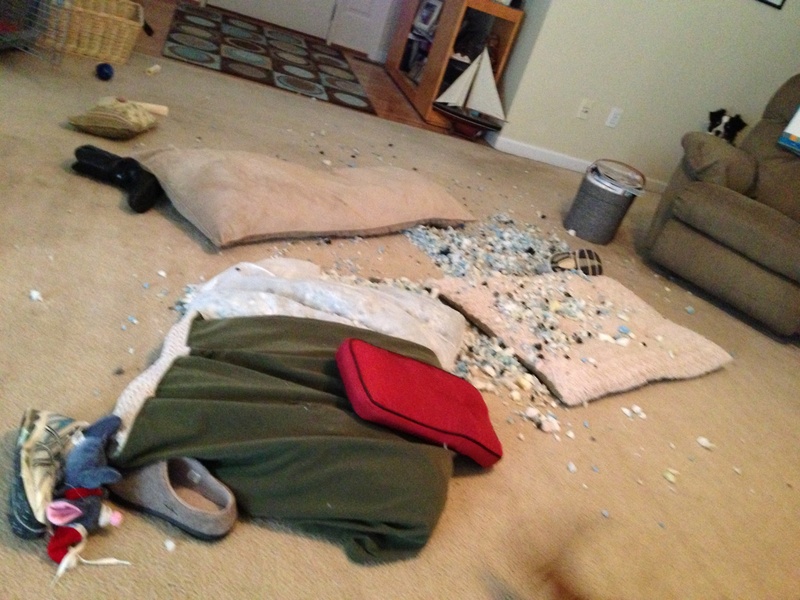 We called Brandon again on Tuesday, and he told us one of the dogs had destroyed their bed. It was the big fluffy new ‘pet pad’ we purchased just weeks prior. We touched base with Brandon on the way home. He said they were doing much better. 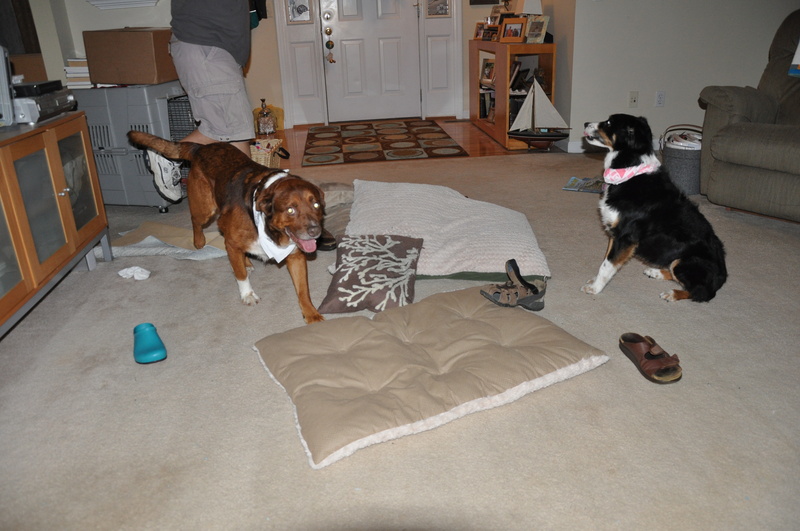 Upon arrival, Brandon showed us the bags of fluff extracted from the dog beds and pillows. I told him not to worry about. I took a couple hours mending what I could, repairing what seemed salvageable. After a day of chores, hubby and I decided to go grab a Culver’s custard. As we walked in the house and turned the corner to the living room, this is what we saw. We’d been gone 45 minutes. I think I’ll go back to Sandals Resorts. A surprise came in the mail yesterday in the form of a contributor’s copy on Not Your Mother’s Book on Travel. The book looks super, and is an effort from writers all over the world created by Dahylnn McKowen, Ken McKowen, and Terri Elders. Dahylnn and Ken have over 60 years writing and publishing experience, with ten of those years spent as consultants and coauthors for four Chicken Soup Series. 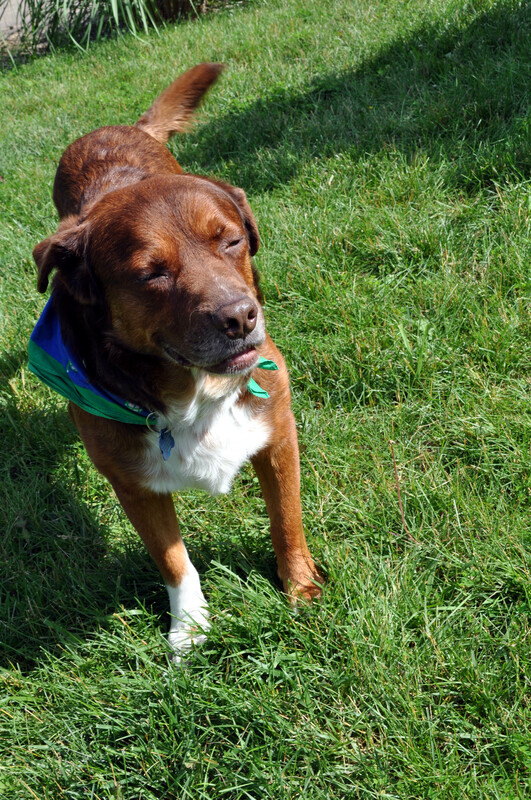 Terri has traveled the globe with the Peace Corps. So excited, I couldn’t wait to dig into the book. Russell and I motored to the local Starbucks yesterday, I ordered a wet cappuccino, and I opened the pages of the anthology. Three local authors and I are holding a book signing at the Barnes and Noble Store in St. Peters, Missouri on June 1. Naturally, I was curious to see their final creation, so I skimmed the Table of Contents until I located their specific chapter. Linda O’Connell’s “Ordering A la Carte” was set on a cruise ship. Her main character had me laughing out loud. The staff at Starbucks had to turn around to see the commotion I was causing. My laughter, now infectious, had them laughing, as well. I shrieked with laughter as I read, Greg Lamping’s “They Only Come Out at Night” about an overnight camping trip and the critters he and his wife encountered. I’m glad I was wearing a Depends, ‘cause I almost peed myself. And Sioux Roslawski’s “Half Right” made me smile from ear-to-ear. While in France, do as the French do. Nuff said. “My Breakfast at Tiffany’s” by Elynne Chaplik-Aleskow was one woman’s whimsical recreation of a scene from a movie classic. New York City in the early morning… I could almost picture myself in Elynne’s shoes. Another Missouri author, Mary-Lane Kamberg wrote about flying when the swine flu epidemic was in the news. “When Pigs Fly” is priceless. And of course, my essay, “No Bad Juju Allowed” is about keeping your sense of humor on a scuba live-aboard during Tropical Storm Jerry. Terri Elders has stories in the anthology as well. Can’t wait to meet her – she seems pretty cool. I’ll see her at our book signing. 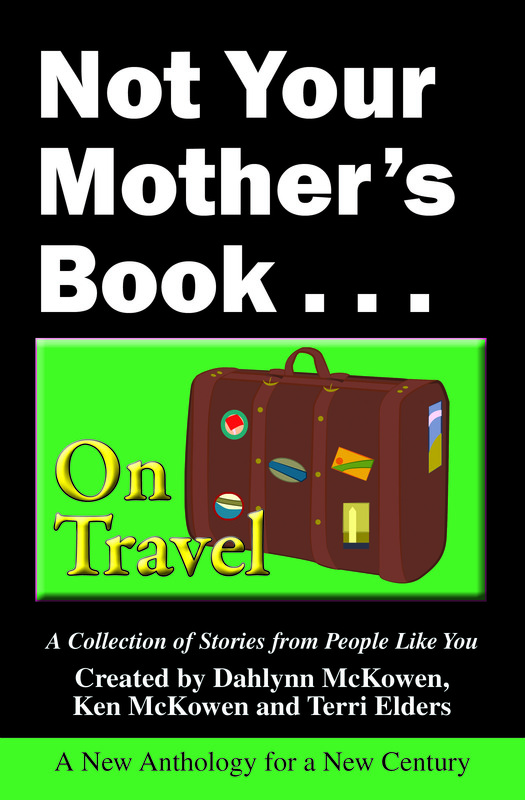 So go get your copy of “Not Your Mother’s Book… on Travel” by Publishing Syndicate. You won’t be disappointed. The authors in the book are rare gems. Just received a congratulatory email from Dahlynn McKowen, CEO, Publisher and Creator of Not Your Mother’s Books, Publishing Syndicate LLC. My essay “No Bad Juju Allowed” about my personal account of Tropical Storm Jerry will be distributed nationwide in the NYMB on Travel due out March 26, 2013. If you have not read NYMB’s, I urge you to do so. There are many local writers I know in several of the books distributed in the recent months.